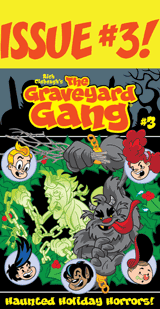 Mr. Wilson meets The Graveyard Gang, and he might be regretting it! 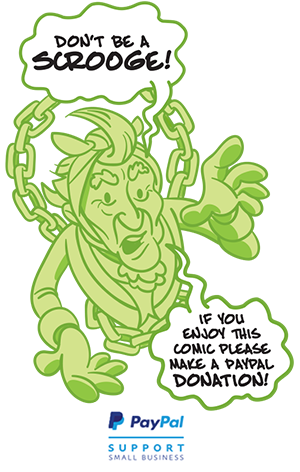 Our colonial zombie is put upon once again but this week he’s got 5 kids to deal with! 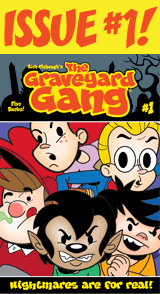 It’s been a while since I had the whole Gang in a comic so this was fun to do! And it’s a fitting end to this current run of ‘Mr. Wilson’s Woes’! We’ll give poor Mr. Wilson a break to put himself back together! 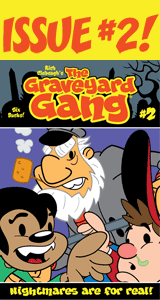 Next week starts a new Graveyard Gang comic strip! 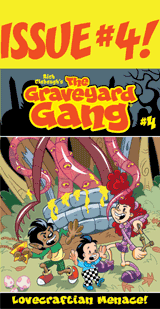 Who will be in this new strip, well keep an eye on The Graveyard Gang Facebook page for teases! For now I’ll just say it’ll feature one of the Gang! I hope you’re enjoying these comics I’ve been doing the past 7 weeks! 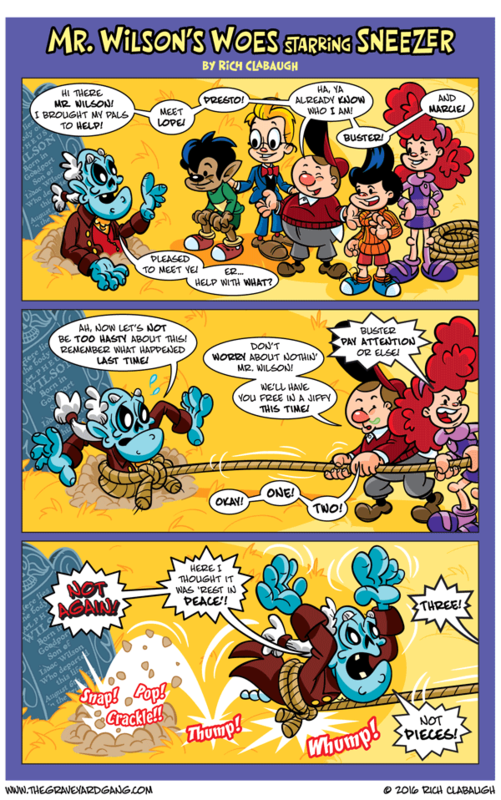 I’ve got a few more weeks of the ‘gag’ strips then I’ll move to short little tales which I can’t wait to share! I love New England folklore, so I read lots of books on the subject which has given me loads of story ideas for The Graveyard Gang. Many of these won’t need many pages to tell so I’m gonna keep them on the short side but it’ll give a chance for certain characters to shine and some new ones to debut! Well that’s it for now, thanks again for reading out my comics and please spread the word! Thanks! yes, it HAS been way too long! lol A crossover adventure would be a blast! Capt. Squallus and old Custer have crossed paths in the past for sure! 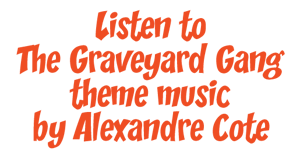 Thanks so much for reading, I really appreciate it! Yikes! Hes half the man he used to be. This is gonna take a lot of duct tape! Yes luckily he goes back together easily enough! Thanks for reading Mat! His lower part is still at peace, at least. Yes, lucky they can’t get to that … yet.